As you can clearly tell by looking at this blog's archive, as of late, my life has been lacking in inspiring theatre. Whatever was on in Finland during the first half of 2018 didn't really strike a chord with me, and the Finnish summer theatre season, with its traditional abundance of light plots and distasteful jokes accentuated with an occasional naked behind... It's just not what I'm looking for right now. Thus, no theatre for me for several months. Luckily, vikings came to my rescue! 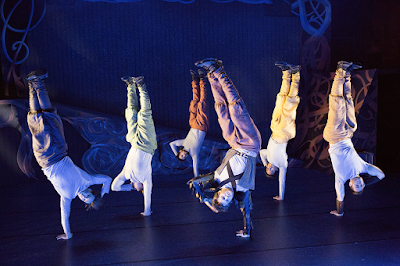 I just spent a couple of weeks in Norway, and in Bergen, I came across Norr – Da gudene breaket, a Norse mythology themed co-production by the Norwegian breakdance crew Absence and the Bergen-based theatre Den Nationale Scene. Beforehand, I knew nothing about either breakdancing or Norse mythology. To be honest, I also didn't expect much. Outside the theatre, the production was boldly advertised as "Norway's most extraordinary viking show", which sounded a little too good to be true. Judging by the hyperbole-laden posters alone, I was slightly afraid it might turn out to be a tastless cash grab designed to draw in viking-crazed tourists – but having been without theatre for so long and simply wishing to see something, I took the chance and bought a ticket. Of course, it quickly turned out that the show truely is extraordinary. In Norr, six dancers (Andreas Roksvåg, Piero Issa, Christopher Bottolfsen, Daniel Grindeland, Halvard Haldorsen and Ole Petter Knarvik) play mythological figures such as Odin, Thor and Loki. 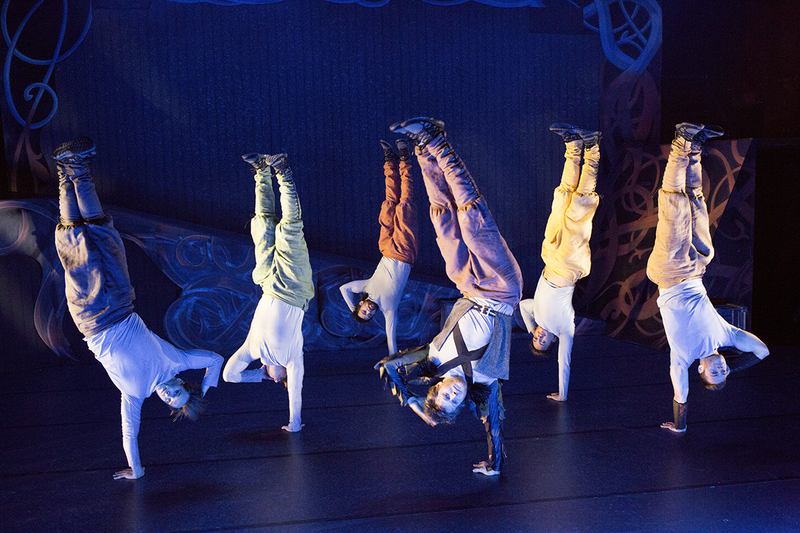 The one-hour-show follows the fates of the Norse gods from the creation of the universe to its violent destruction, showing us vignettes based on different tales, all told via breakdancing. Inspired by the show, I spent the journey back to Finland reading about Norse mythology online, but I don't yet know enough about it to say if this is an accurate interpretation of the tales or not. What I can say, though, is that I think the intense Nordic myths and the energetic, powerful language of breakdance are a perfect fit. In Norr, gods travel across different realms of the cosmos, battling mythical creatures as they go. The show features some rather melodramatic narration (apparently adapted from original old Norse poems) and more light-hearted dialogue – in English, so it's very tourist-friendly. The music (by Tomtom Studio, Dj Embee, Jonathan Sigsworth, Haakon Lund, Canardus Horribilis and Hans Einar Appeland) and the lights (by Einar Bjarkø) mix with the movement just right, so well they create a couple of moments where time seems to slow down a little. Or maybe that was the overwhelming effect of seeing breakdancing live for the first time! I'm seriously in awe, thinking back to the talent of the dancers. They create fun characters – my favourites were Grindeland and Issa as brothers Thor and Baldr, one as brash and boisterous as the other is sweet and loving. It's a really good show for a breakdance novice like me, the characters and the stories are entertaining and the movement is truely impressive. My mouth was really left hanging open by some of the tricks. Thor high-fiving a valiant mortal. Norr has been playing since 2015, so even though the summer 2018 performances are almost over (last show July 22th), maybe you can catch it sometime in the future if you happen to be visiting Bergen. Or something else by Abscence Crew, I'm sure their other performances are equally impressive. 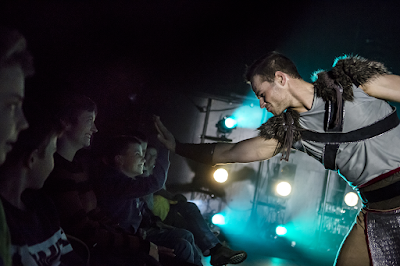 This show is a good fit for the whole family, and the dancers interact with audience members both big and small – if you're not a fan of that, maybe avoid the front row altogether... During the curtain call, a lucky little kid even got to share a moment onstage with the god Baldr. This show washed away my theatrical doldrums and inspired me to learn more about Norse mythology, so I'm doubly glad I happened to stumble across it. Breaking viking magic!